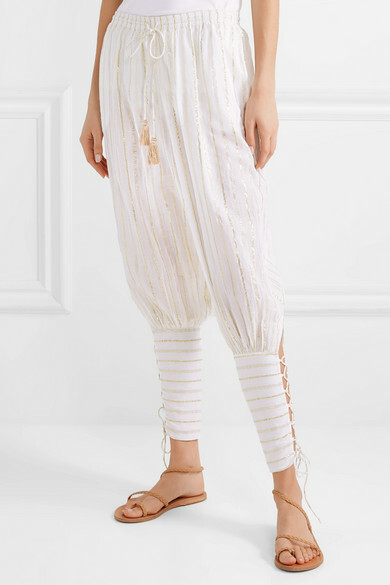 Miguelina's 'Tara' pants are exceptionally comfortable to wear, which is exactly what everyone wants on vacation, right? Cut for a relaxed fit with a dropped crotch, they're made from lightweight white cotton-voile have lace-up cuffs. 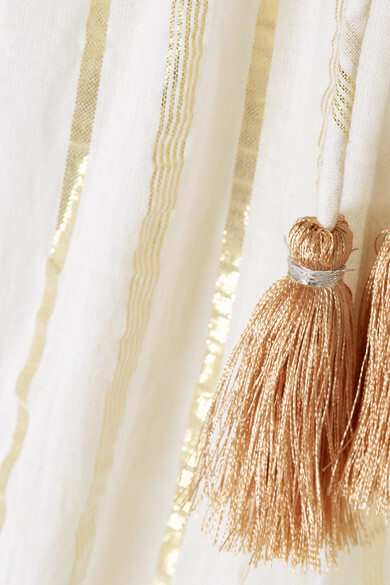 The drawstring ties are tipped with gold tassels to match the shimmering Lurex stripes. Shown here with: Miguelina Kimono, Cult Gaia Tote, Ancient Greek Sandals Sandals, Annie Costello Brown Earrings.